Wiertz Family established the Wiertz Company, a family run company in the province of Limburg. 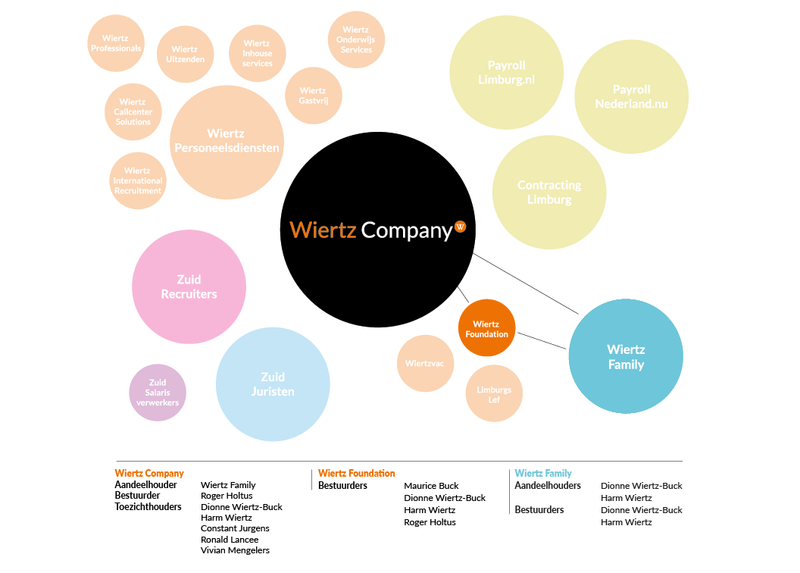 Wiertz Company enjoys a strong family heritage, uniting man and work. Our various manifestations – Wiertz Personnel Services, Payroll Limburg, Payroll Nederland, Contracting Limburg, ZUID recruiters, ZUID lawyers and ZUID salary processors – offer a wide range of professionally appropriate services with fitting personnel policies that contribute significantly to the success of organisations. Wiertz Company enjoys a strong family heritage, uniting man and work. Our various manifestations – Wiertz Personnel Services, Payroll Limburg, Payroll Nederland, Contracting Limburg, ZUID recruiters, ZUID lawyers and ZUID salary processors – offer a wide range of professionally appropriate services with fitting personnel policies that contribute significantly to the success of organisations. Wiertz Personnel Services’ strength lies in work. It’s what we make happen. Featuring Limburg’s most robust locally represented office network, our staff work to assist flex workers into temporary and permanent jobs across all educational levels and sectors; something we do every day with enthusiasm and passion! We strive to maximise everyone’s talents and abilities. Armed with our various bespoke services, we remain flexible enough to ensure that any company requirements are always successfully fulfilled. We are the recognised employment agency in Limburg. An organisation that just oozes passion, entrepreneurial spirit and quality and where a local approach underpinned by personal attention will always prove key. Wiertz Gastvrij represents hospitality at a high level and offers clients bespoke solutions, quality assured down to the smallest detail. Wiertz Gastvrij achieves this with a job pool comprising a permanent group of flexible and very experienced catering specialists in order to guarantee a varied service that meets the needs of its clients. ZUID Recruiters supports companies in finding the required talents at secondary vocational and higher professional levels to fill temporary or permanent vacancies or projects. And of course also for that particular job which proves tricky to fill. How do they do this? By approaching things slightly differently. Finding that singular talent who exactly fits your company’s requirements is a great deal more than just fishing out a CV. This is where ZUID Recruiters make all the difference. Search, screen, approach, follow, entice and bind. Or, as they refer to it, ‘a top-class sport’. Every day turning in a top performance to find exactly the right candidate for your company. Continuing on where others leave off. They do this by giving meticulous attention to your vacancy, your candidate, your company. ZUID Lawyers supports companies with legal advice and interim lawyers. ZUID Lawyers was forged by a combination of market demands and the complexity of Dutch commercial legislation. No one is a specialist in everything. For this reason ZUID Lawyers can offer for example various bespoke legal services or an interim lawyer for projects. ZUID Lawyers sets itself apart by its decisive approach and attractive rates. Many companies use these services, for example by outsourcing part or even all of their legal affairs, which in turn allows them to concentrate fully on their core activities and business. ZUID Lawyers’ approach can be summed up in their maxim: things are difficult enough as it is. ZUID Salary Processors can take care of your entire salary admin, guaranteeing that everything will be delivered correctly and on time. These services ensure that an organisation is free to focus on their core activities. ZUID Salary Processors is a specialist administrative services supplier offering expert personnel and salary administration. They ensure your staff is paid correctly and on time. Meanwhile you of course will benefit from real-time overviews and complete management reports. ZUID Salary Processors go beyond the expected. As well as a perfect execution you can rely on meticulous knowledge of employment law, including amendments and benchmarks, as well as Collective Labour Agreements. Payroll Limburg.nl is the largest regional payroll service supplier with offices in South and North Limburg. The services offer companies and the self-employed the opportunity to hire flexible, freelance and permanent staff, at reduced risks and without the usual administrative burdens. And all this at an attractive and competitive rate. Payroll Limburg.nl takes care of the personnel, salary and health & safety administration and will also maintain contact with the UWV (Employed Person’s Insurance Administration Agency) and Tax Authorities. As with all other parts of Wiertz Company, Payroll Limburg.nl distinguishes itself by its personal approach, combined with entrepreneurial spirit and clear focus on quality. It’s simply woven into their DNA; something which sets them apart from other services suppliers. They are always there for you and your staff and demonstrate this daily with enthusiasm and full commitment. If an organisation operates from multiple locations throughout the Netherlands, we call upon our Payroll Nederland.nu colleagues. They work with the identical services, systems and methods as Payroll Limburg.nl. Payroll Nederland.nu is able to offer a nationwide solution, with the appropriate superior quality, approach and competitive rates. Contracting Limburg starts where the standard employment agencies leave off; they take over part of your production, process or department. Contracting Limburg will offer you, as a client, an obligation contract, becoming responsible for the delivery of products, not the delivery of staff. You do not pay per hour worked, but rather a previously agreed rate per service delivered. The activities performed by Contracting Limburg are ring-fenced from your own process and supervision, but performed at your business location. Contracting Limburg takes care of the entire work related process and is therefore (financially) responsible for the planning, administration, management and supervision. Roda Support, supporter of work, profiles itself as the new job agency with Roda JC football club at its heart. Roda Support arose from a combination of a passion for social entrepreneurship matched only by a passion for Roda JC. Roda Support places flex workers at any company and institution which also carries a flame for Roda JC. For the most part, the flex workers will be Roda JC supporters. A portion of the revenue generated is ploughed back into Roda JC. Roda Support arranges everything down to the finest detail with the result; supporters get jobs, sponsors get their workers and the football club benefits. Roda Support enjoys an exclusive collaboration with Payroll Limburg.nl, part of Wiertz Personnel Services.